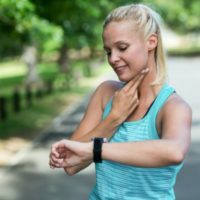 Perhaps you have read an article about heart rate training or an exercise professional has prescribed a certain intensity of exercise for you, but how do you find it and what does it all mean? Your maximum heart rate can be estimated using a little math to find your age-predicted maximum heart rate. First, take your age (example: 30 years old) and subtract it from 220 (220-30 = 190). The final number, 190 beats per minute (bpm) in our example, is your estimated age-predicted max heart rate. There is variance in your true max heart rate (+/- 10 bpm), but individual variation has little influence in establishing effective training ranges for healthy people. Now that you know your max heart rate, you can use it to calculate HR percentages. For example, some exercise programs may prescribe exercise at 70% of your HRmax. To find this HR goal, you will multiply the percentage as a decimal, in this case, 70% or 0.7, by your HRmax. In our example, this would look like (190 x 0.7) to get 133 bpm. This means you would exercise for however long the prescribed duration is for at this HR. Some exercises may prescribe a higher heart rate percentage, like 90-95%. You would apply the same principle and just multiply HRmax by 0.9 or 0.95. If you notice you are above your target HR but able to maintain it, it could be likely your max HR is greater than estimated and vice versa if you have trouble maintaining a prescribed HR. This is due to individual variation and should be noted. You can easily take your HR by placing your pointer and middle finger and placing them on the inside of your opposite wrist below your thumb. Take a second to find and feel your pulse pumping. Once you do, count the beats for 15 seconds. Multiply this number by 4 to get the number of beats per minute. For example, if you counted 25 beats, multiply it by 4 and you get 100 bpm. An alternative is to wear a HR monitor device that tells you your HR on a watch or electronic device. This may be easier for sports like running, biking, or rowing when you cannot stop frequently to take your HR. Sometimes you hear the terms “max effort,” “moderate intensity,” or “all out” exercise. What does this all mean? All-out or Max-effort: Refers to giving 100% effort or your maximal perceived exertion. It would be a 19, very, very hard, on a 1-20 Borg scale of rating of perceived exertion (RPE). It is also relative to exercise duration. For example, your max effort pace for an 8-second sprint will be faster than your max effort pace for 30 seconds because it is a shorter time period so you, therefore, should be able to go faster relative to pace for a shorter period of time. Phew, now that you know all the exercise prescription lingo, lace up your shoes and get that heart pumping! McArdle WD, Katch FI, Katch VL. Exercise physiology: Nutrition, energy, and human performance. 7th ed. Baltimore, MD: Lippincott Williams & Wilkins; 2010. Center for Disease Control and Prevention. Target heart rate and estimated maximum heart rate. CDC website. Updated August 10, 2015. Accessed April 18, 2017. « What You Forgot for Spring Cleaning!